How Do Story Points Relate to Hours? This shows that some stories took more time than others and some stories took less time, but overall the amount of time spent on your one-point stories takes on the shape of the familiar normal distribution. If the one-point stories are centered around a mean of x, ideally the two-point stories will be centered around a mean of 2x. This will never be exactly the case, of course, but a team that does a good job of estimating will be sufficiently close for reliable plans to be made from their estimates. 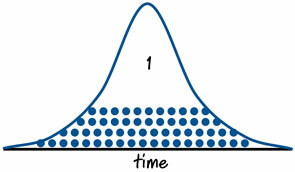 What these two figures show us is that is the relationship between points and hours is a distribution. One point equals a distribution with a mean of x and some standard deviation. The same is true, of course, for two-point stories, and so on… By the way, notice that I've drawn the distributions of one- and two-point stories as having overlapping tails. It should be totally realistic that the biggest story that a team put “one story point” on might turn out to take more time than the smallest story they put a two on. After all, no team can estimate with perfect insight, especially at the story point level. So, while the tails of the one- and two-point distributions will overlap, it would be extraordinarily unlikely that the tails of, say, the one- and thirteen-point distributions will overlap.